And something that was cost effective so as to not increase the price with excessive packaging. A big ask, I know!!! But then we discovered SINAMAY. It comes from the Abaca Plant, a tree like herb related to the banana. The differences are that the Abaca Plants are smaller and their leaves are more upright with a narrower pointed end and the colour is a darker green. Its flower is smaller and the fruit is inedible and full of seeds. As the Abaca Plant reaches maturity they produce suckers, so when the old plant is chopped down the younger one already has a good start. It is the stem of the plant that is used to produce Sinamay, the leafy part is cut off to mulch back into the soil. The stem of the Abaca Plant is made up of hundreds of leaf stems furled tightly together called petioles. Once the plant is chopped, these petioles are separated and split into strips. These strips are pulled under a knife resting on block to separate the fibres. The cutting and stripping of the fibre should be done within 24 hours as the petioles deteriorate very quickly. The fibres are then boiled to improve their sheen and hung to dry. After they are dyed or left natural and then woven into rolls of fabric using traditional hand-looms. Our Sinamay bags use a mix of dyed and undyed fibres and the beautiful sheen is completely natural. We know you will love this plastic free alternative packaging as much as we do and it ticks all the boxes for our wish list, as well as supporting small producers in the Philippines. 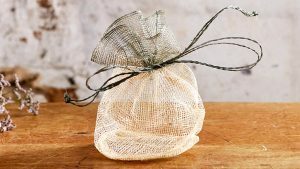 As Abaca fibre is three times stronger than cotton or silk, and fabric made from 100% Abaca can last for over 100 years – this little Sinamay Bag can have a long life. So don’t just put it into the compost bin when you use your soap. Reuse it as the beautiful natural gift wrap that it is. A hand-woven Sinamay drawstring bag. 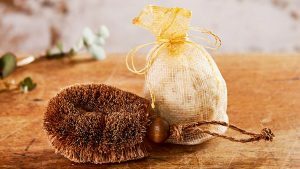 Sinamay is a natural plant fibre from the Abaca Plant. The handmade olive and coconut oil soap contains no palm oil or artificial fragrances. The hand-rolled olive and coconut oil soap contains the essential oil of lemongrass for its anti-microbial and deodorising properties to clean and disinfect hands when handling food. The soap contains no palm oil or artificial colours and fragrances.